WhatsApp recently introduced the option to send any type of file through its instant messenger, but new features are expected to come to the app in the not so distant future. Some of these new features have already been implemented into the app, but they are hidden to the public for the time being. One of the most recent WhatsApp for iOS updates introduced one feature that would certainly be very useful to users: the option to watch YouTube videos directly in WhatsApp. 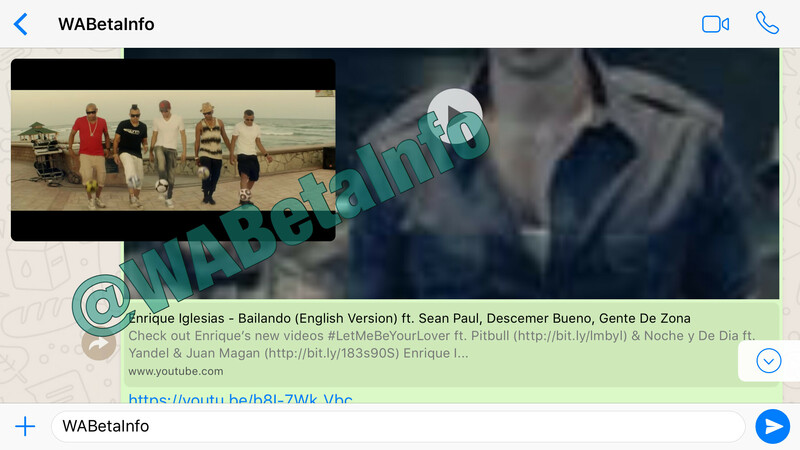 Although it's still under development, the new feature allows those who can access it to watch YouTube videos in WhatsApp in the same manner as Picture in Picture mode. You can either drag the Picture in Picture mode to expand it on the entire screen, or you can open the YouTube video in a completely different WhatsApp window. You can even drag the video window to the left or right of the screen without effectively stopping it so that you can continue to read your conversation. Apparently, the option to watch YouTube videos in WhatsApp fully supports iPhone 6 and newer devices, but Apple smartphones with smaller screens might be compatible as well. Whatsapp on a roll these days. Btw, is this an ios exclusive feature? How about SMS support!? .. and web extension? After they implemented idiotic status update feature in beginning of the year I've rolled back to previous version of WthatsApp, turned off automatic updates, never updated it and not even going to not to get status update tab appear again. You'll be forced to update once it says that you're running an old version of whatsapp and it is no longer supported. whatsapp versions become obsolete after a while. You will have to update.